Updates to Forgotten Stories, should have the bound arrows included. Also added a 1.5x and 2.5x. I still personally use the 2.5x. First off - "I got tired of needing more than one arrow to kill a rabbit or fox, and watching deer runaway, after two hits, but more importantly, to eliminate the walking pin cushions your foes become." I ended up making this mod to speed up combat, and make it more deadly for you and the AI. I can't stand the pin cushions that the AI is on anything higher than, adept difficulty. All it does is simply raise the arrow damage to 2.5x the vanilla damage. 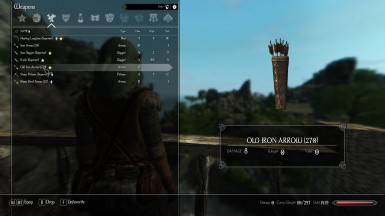 I hand calculated the values, used TESEdit, to create this mod. I was going to keep it personal, but decided to upload it in case anyone else hated the walking pin cushions. This is my first mod, and likely my only mod, if any issues arise, ask nicely, and I can try to fix them, my modding knowledge is limited. I use Mod Organizer primarily, so I recommend installing it with that. NMM Should work as well. All you should need to do is add the contents of the mods data folder to your games data folder. Thanks guys and Gals, hope you enjoy.